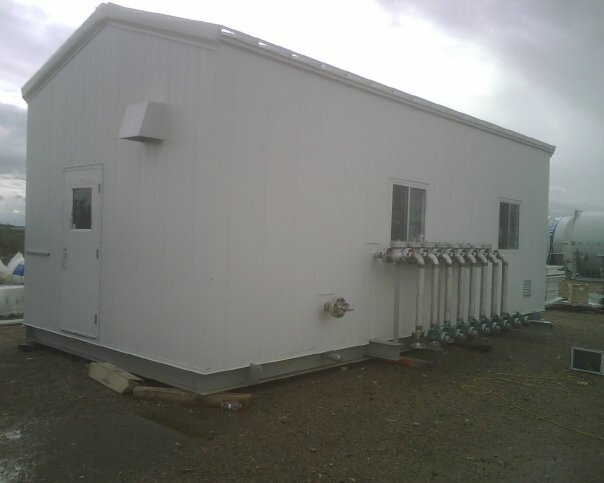 Our buildings can be customized to suit any application and are excellent for on-site or off-site. They are so versatile that the potential uses can be greatly expanded by any imaginative and resourceful user. Our Panel Buildings consist of 1 1/2" - 3" thick polyurethane insulation with an R12 - R24 value. They are developed for extreme temperatures and are superior to combat the fierce climate. These thermal panels are light weight and very strong making excellent enclosures and have a high strength-to-weight ratio, superior moisture and rodent protection. An average 4' x 10' panel weighs approximately 40 Lbs making them easy to handle and frame. The polyurethane panels are ideal for utilidors, (internally housed piping), control equipment and fixtures providing a cost effective method of insulating and enclosing various sizes and lengths of pipe. Cut-outs from panels can be used for doors, hatches, or access points, reducing the amount of material wastage. We also carry Self Framer Buildings which are interlocking panels with an R 12 - R 20 value, as per the customer's size and color preference. Our buildings can be built to any size. They are available in a wide variety of finishes, including galvanized, aluminum, and colorful metal finishes. Our buildings are ideal for temporary or permanent applications with easy relocation capabilities.